Manuel Oliver was grieving in front of a crowd, spreading red paint on what would become the latest portrait of his son, killed in the mass shooting at a high school in Parkland, Fla.
Usually when he paints, Oliver, 50, an artist with abundant salt and pepper hair, listens to music he shared with his son – the Ramones or Guns N’ Roses. But on Saturday he listened to the crowd across from the National Rifle Assn. convention in downtown Dallas. The demonstrators protesting the NRA’s presence were hushed at first. Occasionally, someone shouted encouragement. Then Oliver struck the mural with a hammer. Then again, and again, tearing 17 holes, one for each of the Parkland victims, including his son, Joaquin. He affixed the 17-year-old’s image to the center of the mural, inside a target. Oliver’s face was twisted, tortured, as he struck the mural. Each strike echoed like a shot. The crowd gasped. At least one girl sobbed. The Olivers, like other Parkland parents and students, are grieving through protest, refusing to allow the nation to forget their loss. They call it “graphic activism,” confronting gun advocates, including President Trump, by continuing to conjure images of their son after the Feb. 14 shooting. An image from Oliver’s first “Demand a Change” mural of Joaquin — in a knit cap with a slight smile — now often appears on posters calling for gun control. On Saturday, it was plastered across a banner at the protest. As Oliver’s latest mural took shape, his wife looked on nervously. The crowd had gathered outside City Hall. Across the street at the convention center, more than 80,000 NRA members and supporters were meeting for the second day. More gun rights protesters were expected to arrive in a few hours. Dallas police stood watch along the perimeter. As her son’s face flashed on a billboard displaying shooting victims, her husband gathered sunflowers and poked them through each of the holes he had hammered in the mural. He had pasted images on the mural, too. Dana Loesch, a host on NRATV, was dressed as a clown toting an AR-15 rifle. Trump, who addressed the convention the day before, appeared as a circus ringmaster. Joaquin’s girlfriend sent her a text message from the family’s house in Florida, where she had slept because she wanted to feel close to Joaquin. She was going to the prom with his best friend. She promised to send the Olivers a photo of her dress. Patricia Oliver, 51, a slight figure with large brown eyes like her son, was glad to be traveling. She said she felt compelled to return to Stoneman Douglas High for graduation June 3. Her son died a senior. He would want her to watch his classmates, who have filled her house since the shooting, cross the stage and receive their diplomas. Joaquin’s older sister, Andrea, 25, will claim his. “He would be sad because he didn’t get to finish,” Patricia Oliver said. Once her husband finished his mural Saturday, he challenged Trump to visit their home in Coral Springs. “Spend five minutes in Joaquin’s empty room,” Oliver said, his hands sooty with black spray paint. Above his thick beard, his face had calmed. The Olivers moved to the U.S. from Venezuela 15 years ago, became citizens and settled in Parkland because of the safe, suburban schools. Manuel Oliver became creative director at an entertainment company, creating murals in his spare time for private parties. Painting his son’s image over and over is painful, he said, but harnessing his pain is empowering. After the shooting, the Olivers started a nonprofit to empower youth, voting and fighting the NRA lobby, especially its advocacy of assault rifles. 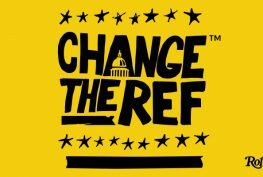 The couple named their group “Change the Ref” because of a discussion Joaquin had with his father when they got booted from a basketball game after a series of bad calls. “Are you going to do anything?” Joaquin asked his father, suggesting the referee had been bribed. They have erected murals in Miami, New York and Los Angeles, where they visited students at Dr. Maya Angelou Community High School. They plan to create a mural in Orlando, Fla., next month on the anniversary of the mass shooting at Pulse nightclub. They always encourage onlookers to sign the artwork, especially youth, as an endorsement of what they’re fighting for. “It’s a way to have Joaquin still send a message,” his father said. The Olivers appeared with Parkland students and other families of the fallen at the March for Our Lives protest in Washington, D.C., and other events. The Olivers were joined Saturday by fellow Parkland parent Fred Guttenberg, who spoke out against the NRA after his 14-year-old daughter, Jaime, was killed in the shooting. Other parents of mass shooting victims have been protesting for years. Some joined the Olivers on Saturday, including Sandy Phillips, who lost her 24-year-old daughter, Jessi, in the mass shooting at a movie theater in Aurora, Colo., six years ago. After Oliver finished his mural and students took the stage to sign it, Phillips approached. She had tears in her eyes. “I don’t tear up very often,” she said. Phillips hopes the Olivers can accomplish what she and her husband have tried to do for years: expand gun control. “The emotional rawness, it’s important for people to see,” she said. As the Olivers finished protesting, armed counter-protesters began to arrive. The couple watched from a street corner as scores of men, women and children passed. Some had AR-15 rifles slung across their chests. Manuel Oliver noticed an elderly man with a pistol holstered on his hip walking a small boy by the hand (it’s legal to carry a pistol openly in Texas). The two men traded loaded glances. Oliver took his wife’s hand, and shrugged off the encounter. “No one can hurt me more than they already did,” he said. And they left to join another downtown protest.